ResqVester (tm) is a new economical safety and signaling system for use on lakes and oceans, intended to be attached to a life vest, also known as a PFD, or Personal Flotation Device. ResqVester's low price enables anyone out on a boat to have a multifunctional life saving system to enable rescue if the vessel overturns or you otherwise go overboard. ResqVester is also ideal for survival kits, especially on private planes. It is perfect for hikers and campers, especially on dangerous terrain. ResqVester should also be carried by snorkelers, scuba divers and others in case they are separated from their boat. ResqVester offers a number of features. First, the system has a high intensity two chamber whistle which will make more noise and travel much farther over water than your voice. Shouting will make you go hoarse while blowing a whistle will not and you can keep it up much longer. Attached to the whistle is a compass to help you know which way land is. Also attached is a tiny but high intensity led flasher which alternates between blue and red. The flasher activates by simply tightening it. It will operate continuously for over 6 hours, including underwater. The system comes with two sets of extra batteries. 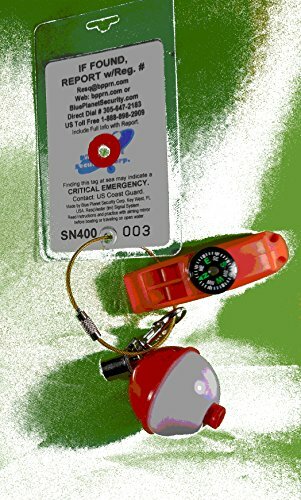 Attached to the flasher is a float, or fishing bobber. The led flasher has a spring clip to remove it from the plastic coated stainless steel cable that holds all the parts together. The float is attached to the flasher so if the flasher is removed from the cable and dropped it will float. The entire ResqVester system will float with the float attached. The stainless steel cable has screw ends so other items can be attached or items replaced. The most important feature is the tag. First, one side is a signaling mirror with an aiming sight which meets U.S. Coast Guard recommendations for signaling mirrors. One photo shows the camera image which demonstrates how reflective the mirror is. Do NOT go boating without Resqvester attached to every life vest. Coast Guard Recommended Aimable Emergency Signaling Mirror. Can be seen for 10+ miles. Blue/Red LED Flasher Works Over 6 Hours even Underwater. 2 Extra Sets of Cells. If you have any questions about this product by Blue Planet Security, contact us by completing and submitting the form below. If you are looking for a specif part number, please include it with your message.